NEW CONSTRUCTION–TO BE BUILT–THE MASON PLAN–1144 Sq. 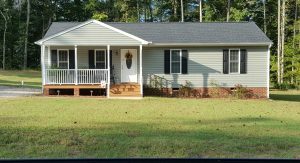 Ft.–ON 6.7 PRIVATE ACRES IN KING WILLIAM COUNTY. PICK YOUR OWN CUSTOM COLORS AND FINISHES!! THIS HOME OFFERS 1144 SQ.FT. WITH THREE BEDROOMS, TWO FULL BATHS NESTLED IN THE WOODS BY A GENTLE FLOWING STREAM. THIS PLAN HAS A FRONT PORCH, 10 x 12 REAR DECK, WALK-IN CLOSET IN THE MASTER BEDROOM, DOUBLE HUNG VINYL TILT WINDOWS AND SCREENS, CULTURED MARBLE VANITY TOPS, CUSTOM PINE CABINETS, 30 YEAR DIMENSIONAL SHINGLES, HEAT PUMP WITH CENTRAL AIR AND MUCH MORE!! OR, BUILDER CAN PRICE YOUR FLOOR PLAN ON THIS EXPANSIVE 6.7 ACRE LOT Ask about possible $1500 Closing Cost Credit!